A waiter (waitress) is also often referred to as a food server. Waiters are employed by restaurants to serve meals to customers. An upscale restaurant waiter works in a high-end (fine-dining, gourmet or country-club) establishment. Waiters make up the majority of positions held in the food and beverage serving and related jobs category. However, only a small percentage of them are upscale restaurant waiters. An upscale waiter works in a prominent restaurant. Their job description differs, depending on the company but many duties are typical. This includes describing items on the menu (ingredients used along with how it is prepared, cooked and served), taking food and beverage orders, serving and checking back with customers during the meal for any additional needs along with providing checks and taking payments. They must be able to work with other restaurant employees to present an enjoyable dining experience to their customers. Upscale restaurant waiter performs the duties of a regular waiter with more attention given to the customers, the service and the overall dining experience. 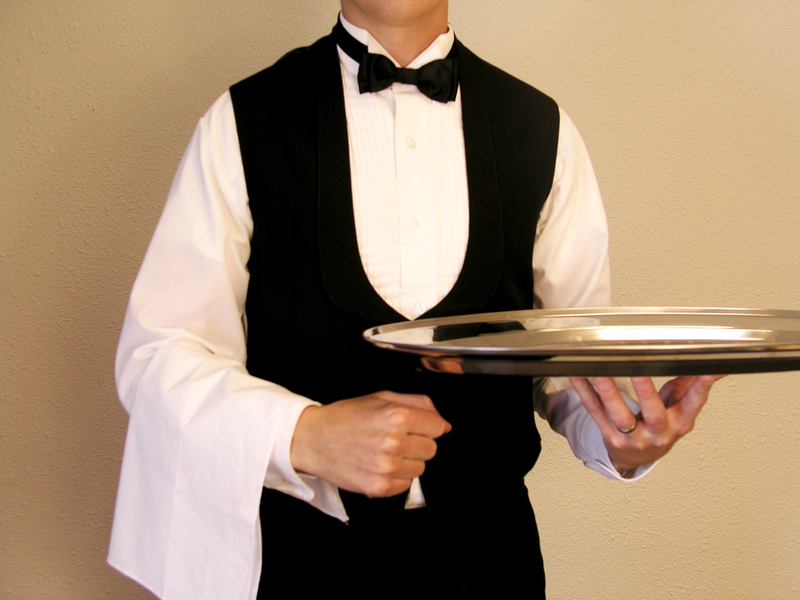 This type of a waiter typically dresses more formally and may be directed by a headwaiter. Some high-end restaurants that provide a certain style of cuisine need waiters to serve food in out-of-the ordinary or formal styles. It is also possible to require these types of servers to be fluent in foreign languages. This type of job requires the ability to stand on your feet the majority of the time. It also entails carrying trays weighted down significantly with food, glasses, dishes and working with items of extreme hot or cold temperatures. It is common to have peak periods of business that must be handled sufficiently. An upscale restaurant waiter is paid more than other servers but relies on tips for an income. The tips are typically higher than in more modest restaurants. Work is part time and full time, with schedules based around busy meal times, holidays, events and weekends. It is common to be required to have some previous serving or fine-dining experience to get a job as an upscale waiter. Waiters do not typically need any certain educational achievements besides a high school diploma. Several establishments provide on the job training, proper food handling methods and cleanliness procedures. Training provided may focus on certain serving techniques, the restaurant's philosophy, how to work as a team and customer relations. It is possible to obtain additional knowledge through classes available privately and publicly at educational institutes, associations or restaurant chains. An upscale restaurant waiter should have an ability to remember things. This includes food and drink orders, customer names and their preferences. Advancement is rare in this profession, but some waiters can be offered formal management training and manager positions in the restaurant.